The 405 meets Richard Dawson: "People are gods." Sam Boullier talks to Richard Dawson about the relationship between fact and fiction and the painter-like craftmanship and autobiographical style embedded in his work. Far from what we have come to expect when we hear the words 'acoustic singer/songwriter', Richard Dawson has come to create a universe of original and recognisable albums. Lyrically, his songs tend to play with the dark beauty of poetic specificity. He wrestles with religion and autobiography, horror and humour, the subjectivity of memory and 'objectivity' of history colliding into something undeniably singular. Touring extensively this year, Dawson has become somewhat of a sensation. He doesn't shy away from repetition, instrumentally or tonally, and it is this that makes everything he makes feel so deeply honest. 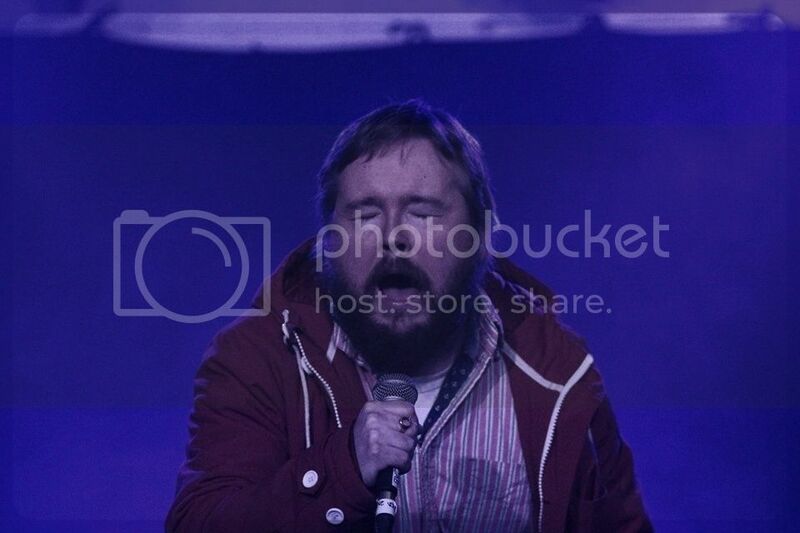 I caught up with him to talk about his working methods, inspiration and what lies in the past and the future of Richard Dawson. What's the story with Richard Sings Songs and Plays the Guitar and The Magic Bridge? Where did those two albums come from? Well, uh. I can't really think so far back now. It was so long ago. You wrote The Glass Trunk based on research you did at the Tyne and Wear Archives. Was it a contrast to write from archived material rather than from personal experience? Well it wasn't so different. Everything's research-based, even if it's come from your own experience. The Glass Trunk still feels very personal. It's still addressing the same issues through events that have somehow been solidified by print. But I don't see it from being any different to writing about things that have happened in my life or to people I know. I guess the danger of print is that that's the only record we have of it, so, you know, how things are reported. But I guess that is the same with memory, how we remember things isn't exactly as they were, in the moment. In terms of that relationship with subjectivity, or fiction and reality, when you are writing from a different perspective, like Sylvester Hurlbert on the final track of The Glass Trunk, how much do you feel you are taking on his persona? With that song there was, yeah, researching people and creating the character and dwelling on him for a while. There are other more direct things. Really a lot of it was through eating differently. When I was writing that I was eating really basic foods I imagined he would be able to get hold of back then. And just travelling in my mind to get closer to him somehow. So it was almost method writing, like method acting? Yeah I was thinking about that for sure, the Stanislavskian approach. How autobiographical is your most recent album Nothing Important? I'm not sure how important it is, how accurate the song is or isn't. I like the idea that accuracy is not so crucial. But I can say, well I'm not trying to be evasive, or maybe I am trying to be evasive but not for uh, I'm trying to be evasive but only so it doesn't scupper the song. I'd like people to find whatever they might find there. But there was a trip to Featherstone Castle. When I listen to The Vile Stuff, sometimes I find it disturbing, other times quite funny. Is that your aim, that its not meant to be specific, it's for the listener to engage with? There are contradictions at work in everything. Contradiction is at the heart of the world as I see it. So I wouldn't necessarily like to say what my aim was, but I think it's perfectly reasonable for someone to find it funny or ridiculous or laughable. At the same time, there are things there that are actually quite disturbing. So I think that those things coexist. Sun Ra has a great answer to this question. Somebody asked him what inspires him and he says first it's the planets and nature. But he also said musicians, all musicians of any style, they are all an inspiration to him. I kind of go along with that. My biggest inspiration though is friends and people. People are gods. Do you think there's a parallel, with your vocal style, which holds as much emotion and power as the lyrics themselves. What is the relationship between melodies, vocals is and lyrics? Which comes first? Everything is linked in. The idea of borders is an illusion so, I find that practicing is also composing and composing is practicing. The melodies emerge. I can sit and work and word patterns present themselves. I see it like a painting. With a piece of music or a song you have the structure, like when you stand back and look at the painting. And the lyrics, they're the stories or characters, the objects in that picture. And then you have the brush strokes, how you sing, every note you sing, every time you strike a string is a chance to load the paintbrush with a different amount of paint. Do you apply a different amount of pressure? Do you do like fast strokes, or kind of a spongy squelch on the canvas? All of those things count. So the hope is it's all integrated and hopefully you couldn't separate them out into their constituent parts. Do you feel any responsibilities as a Northern artist? No. That's been asked before. No. I feel a responsibility to make what needs to be made. It's been pretty wild, like. It's been great to get to play more. Share music more. Meet lots of amazing people. It's been quite physically challenging, with the nature of the material. In the past I was more used to doing one-off gigs. I've never done two or three-week runs before. I haven't really trained for that. I've got a bunch of music ready, which I've been working on for the past couple of years, some of it before Nothing Important. I tried writing over the summer, but there's been an awful lot of distractions so I came to realize my focus wasn't really there. But I'm gonna start writing again in January. In the meantime I've been making a few collages and I've been in the process of finishing off an album with Rhodri Davies. We've got a duo called Hen Ogledd. It's an ancient future friendship band. There have been a lot of other things that demand more attention. It's a minefield trying to maintain focus on what counts, but that's really the key. To not worry about how it's going to be received. We have to push on and once it's made, if it's a career disaster, well, it doesn't matter. None of it matters.